I am often inspired by colour; particularly primary blues, reds and yellows. Just looking at pleasing colour combinations brings me joy. 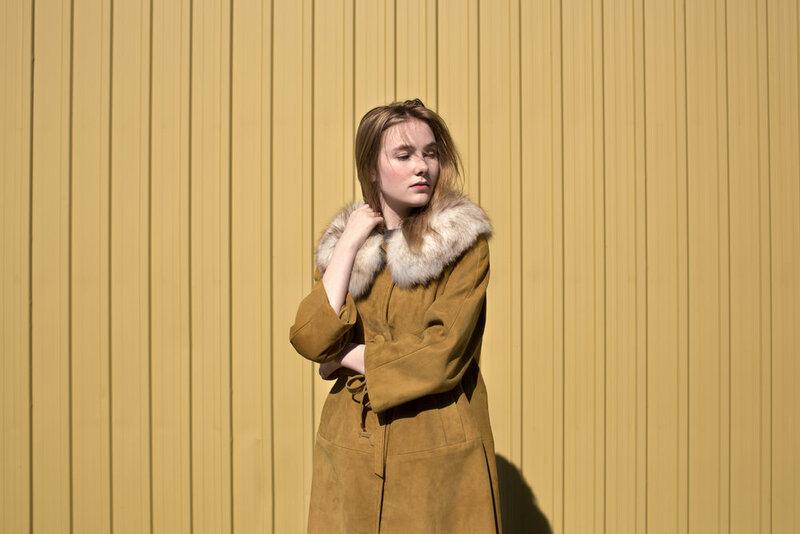 When I spotted a yellow, vintage suede coat at a thrift shop a few months ago, I was ecstatic - I had to use it in a portrait! I also found a similar hue on a workshop wall not too far from my house that would make a perfect backdrop. My creative juices were flowing. Now all I needed was a model. Call it coincidence, serendipity or divine intervention, things seem to fall into place sometimes. I received a message from my friend Jane Van Pelt, also a photographer, that Megan Allan from ANM Management modelling agency would like a few photos for her portfolio. Voila! It was a perfect match. Megan was a dream to photograph. Her delicate features and slight physique were exactly what I envisioned for the series. We did a few costume changes and used colour as the inspiration for the shoot. Although it was a challenge, I used the mid-day sun to create deep contrast and shadows, mindful of not overexposing Megan's beautiful ivory skin. The only aid I used to control the light was a reflector. My sincere thanks to Megan, Jane and Diane for helping to make my colourful vision a reality. Here are a few of my favourites from the shoot.